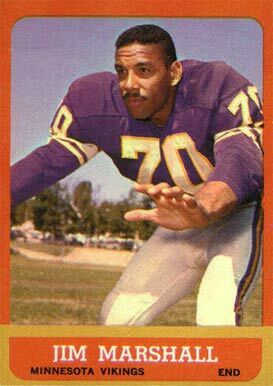 1963 Topps football card of former NFL defensive end Jim Marshall, who enjoyed a long, storied career spanning 20 years in the league, most notably with the Minnesota Vikings. Unfortunately he is mostly remembered for a play in which he recovered an opponent’s fumble and returned it 66 yards, in the wrong direction, resulting in a safety. That play aside, Marshall was a stalwart on the Vikings’ Purple People Eaters defense for 19 seasons, and was an All Pro and Pro Bowler three times. He appeared in 4 Super Bowls for the Vikings in the 1970s. Marshall was an NFL iron man also, and held the league record for longevity with 282 consecutive starts until it was later surpassed by Brett Favre.